Leeds-born Joanne Dexter earned a B.A. in Music at the Royal Scottish Academy. During her time in Glasgow she was awarded the Sybil Tutton Scholarship and won the “Ye Cronies” Opera Competition. She studied Italian at the University of Perugia. Perhaps her greatest asset, alongside her impressive control, flexibility and clarity of tone, is her versatility. This allows her to move effortlessly between the early music repertoire of Bach and Handel to more expansive works such as Verdi’s Requiem and Dvorak’s Stabat Mater, and from the operas of Verdi, Puccini and Mozart to the light opera of Offenbach and musical theatre. 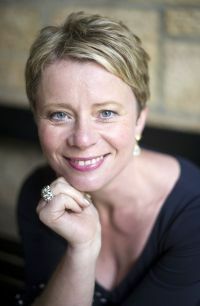 She has worked with numerous leading conductors, directors and composers including David Parry, Paul Daniel, John Pryce-Jones, Wyn Davies, Dietfried Bernet, Richard Farnes, Richard Hickox, Martin Pickard, Jonathan Dove, Cecilia McDowall, David McVicar and Stephen Metcalfe. Her opera credits are extensive, thanks in part to fruitful spells as a soloist with Opera North, English Touring Opera and Pavilion Opera. Operatic roles include: Woodbird (Siegfried), Musetta (La Bohème), Pamina and Papagena (Die Zauberflöte), Lisette (La Rondine), First Lady (Idomeneo), Noble Orphan (Der Rosenkavalier), Shepherd Boy (Tosca), Carolina (Secret Marriage), Karolka (Jenufa); and at the Linbury Theatre, Covent Garden, Hélène (Une Education Manquée). She also appeared in Opera North’s ground-breaking productions of Britten’s Peter Grimes and Gloriana, Sondheim’s Sweeney Todd and, most recently, Dove’s Pinocchio. Joanne’s concert credits are equally impressive. As a soloist for Opera North she has performed in Mendelssohn’s Midsummer Night’s Dream, Opera Galas and Bach Cantatas, Mozart Concert Arias for Wyn Davies, Dvorak’s Stabat Mater with the Liverpool Sinfonia at Chester Cathedral, Vaughan Williams’ Sea Symphony at Durham Cathedral. Her oratorio repertoire is too extensive to list here, but include the standard works of Haydn, Handel, Bach, Mozart, Brahms, Rossini, Fauré and Poulenc amongst others. Abroad, she has sung at the British and United States Embassies in Tokyo, in Madeira, Barcelona, Normandy, Brive and the prestigious Festival d’Aix En Provence in Southern France. With leading accompanist Gary Matthewman, Joanne’s recital at the inaugural Leeds Lieder+ Festival won much acclaim. Broadcast credits as a soloist include “Masterclass” with Thomas Allen (BBC2), the Leeds Lieder+ festival (BBC Radio3), and Messiah with the combined Halifax and Huddersfield Choral Societies (BBC Radio 2). Recordings include First Lady (Idomeneo) for Chandos, conducted by David Parry with the Opera North Chorus and Orchestra.